The Internet communication revolution is being mirrored, in funhouse form, inside American correctional facilities. Companies that have historically focused on prison phone services that connect prisoners to loved ones and lawyers are now branching into video chats. NEWARK, N.J. -- A potential settlement between former Alaska governor Sarah Palin and a New Jersey newspaper over the use of a famous Sept. 11 photograph is stalled over confidentiality issues, court filings show. As the owner of a barber shop and a taxi business in Honduras, Jamie Joel Bautista faced extortion attempts by hired guns tied to local police forces. No one really believes that Tuesday's oral argument in the gay-marriage case, Obergefell v. Hodges, is an occasion for the justices to make up their minds about how they're going to vote. Rather, it's an exercise in making certain points, not so much to their colleagues as to the public. According to reports from the first section of the questioning, the justices had some messages they want you to hear. One day into her new job, U.S. Attorney General Loretta Lynch is already confronting the combustible and difficult issues of race and policing that consumed much of her predecessor’s final months in office. Two decades into her career, Hollie Moore Haynes realized she’d reached a limit: She was never going to lead a private equity firm run by men. So earlier this year, she left Silver Lake Management, where she was a managing director, and founded Luminate Capital Partners. Law Week inspires a variety of events around San Diego. This Law Week 2015 chapter focuses on how technology and intellectual property law affects a variety of fields, especially the biotech industry. 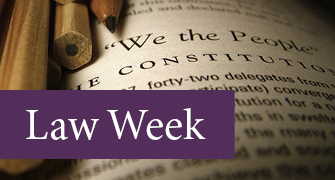 This chapter of Law Week 2015 focuses on corporate and employment law.